The world’s largest tech companies are rushing to connect the next billion people to the Web. Microsoft is creating connectivity by consolidating the small bits of bandwidth between television channels (television whitespaces). Facebook is experimenting with transmitting data via high-flying drones (project Aquila) and Google via balloons (project Loon). The motives in each case seem to be a combination of altruism and savvy commercial thinking. The Web is key to unlocking learning and development, and indeed, new business in the long term. In this blend of exotic technologies one would be excused for thinking that the humble truck had no role to play. But as I discovered on a trip to Indonesia last week, it does. 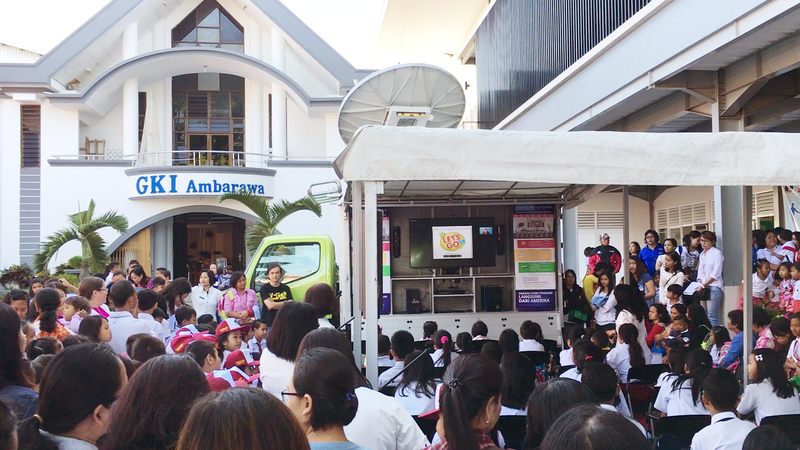 Indomobil, one of Indonesia’s largest truck manufacturers, is investing in producing satellite-connected trucks that act as mobile classrooms, visiting towns and smaller cities on a regular cycle, in order to run TeachCast with Oxford English lessons. The truck parks on level ground (important for correct satellite tracking), the side opens up, chairs are taken off and arranged under a fold-out awning, the satellite dish pivots and starts to track, and a class of around 25 students starts communicating with a US-based teacher via a large television screen. I didn’t quite believe this would work logistically but it does. The students were engaged (as were the parents crowding in at the back—they wanted to have a lesson too) and the up and down-link were smooth and stable. This was witnessed in what proved to be a critical aspect of the learning experience: the audio. Teacher-student interactions (helped by a roaming microphone on the student side) were loud and clear with no lag. Before my visit to the country I had assumed the need for the satellite-connected truck was technological, to allow connection to the We, but I’m no longer convinced this is the case. It’s true that the satellite link provided a stable Web connection (which is critical if you want to run lessons reliably) but everywhere I went last week I was able to connect over 4G or at least 3G and do all the things I usually do with my smartphone. And smartphones like those of Chinese company Oppo, whose green signage appeared everywhere, are plentiful. So why wouldn’t a learner in a town like Ambarawa, in the hills outside of Semarang in Central Java (where the photo above was taken), not just get themselves a smartphone and connect to an English-learning app? Smartphones are likely to become as ubiquitous as motorbikes in Indonesia. It turned out that the experience of learning via satellite-connected truck was as much a social one as a technological one. If technology provided the initial draw, it was the human experience of learning in a social environment, with a live teacher, that maintained the engagement. Vendy, a head teacher from Mutiara Persada School, travelled two hours to Ambarawa to see TeachCast with Oxford in action: the draw of the programme, he explained, was the opportunity for live interaction with a native-speaker, qualified teacher. This leads me to question whether it isn’t the same with all technology endeavours: technology will only succeed to the extent that it enables a social good (in all senses of the word social) and needs to be evaluated in this way, particularly in education. I’m eager to see the new human connections that are enabled by the drones, balloons, and trucks, and the learning that follows for all.